I work mainly in glass and my aim is to communicate the love I have for natural pattern and form. Having set up a studio in Felixstowe in 2001 where I have been able to produce work that has evolved from my degree programme. The landscape in Suffolk and her garden in winter are the best areas for her inspiration. I appreciatethe muted colours and abstract shapes that winter reveals. 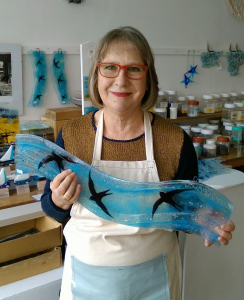 I am a member of Suffolk Craft Society and exhibit regularly with them at Aldeburgh.